This was what was left after my breakfast yesterday. We were reviewing shell fish and mollusks in Fish ID. We sampled everything from shrimp to lobster to mussels. I love seafood and I couldn’t have had a better breakfast. When we do our tastings for fish it isn’t just an opportunity to eat food. Our chef tells us different facts about what we’re eating. He also lets us know different ideas for paring this food with items as well as how it is caught and where it lives. We also review the aromas of the food. Obviously each shellfish has a general taste that most people are familiar with. The aroma is what the eater actually perceives they are tasting. For example when I tasted the sea scallop I got a sweet and briny flavor finished with a more meaty aroma. We were especially lucky yesterday because we actually combined two tastings into one. 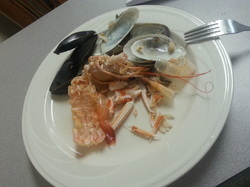 We normally would have only tasted shellfish or mollusks but due to the snow storm we had to make up for lost time. I didn’t complain. Something interesting I found out was facts about the abductor muscle. This is the small round muscle that allows hinged shellfish to open and close. Whenever I prepped scallops at The Perfect Caper, I was told to remove this muscle. Come to find out, that small muscle is essentially a scallop. When you look at mussel shells after you have eaten the animal you will see a small round pad. This pad is very similar to a scallop. Today is our last day of fabrication and we will be taking our final ID test. This is a test that consists of 30 questions. 10 random fish, that we have studied, will be placed on trays and our job will be to to name them as well as answer 3 questions that we should be familiar with. For example we may be given an Atlantic Farm Raised Salmon and be expected to know that it lives in anadromus water, has red flesh due to what it consumes and that it is a high activity fish. The next 7 days of fish will be lecture. We are completely done cutting and we will be moving on to the academic portion of class. I have been told that it is also quite interesting and I am excited to be moving forward in the program. Only one more week until we begin working in a production kitchen and that is extremely exciting.